With his clean image, Singh, one of the most visible BJP faces on TV, strives to make this experiment successful. He calls himself PM Modi’s ‘Experiment Boy’. 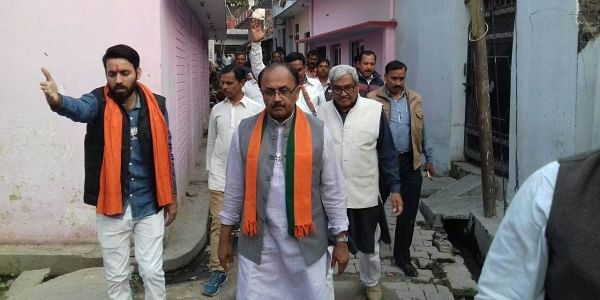 The grandson of late PM Lal Bahadur Shastri and BJP’s national secretary, Siddharth Nath Singh, has taken the plunge into electoral politics on PM Modi’s insistence to redeem the image of Allahabad West, a place identified with mafia don Atiq Ahmad who has represented the constituency several times. With his clean image, Singh, one of the most visible BJP faces on TV, strives to make this experiment successful. He spoke to TNIE’s Namita Bajpai about the challenges before him. What are the main issues of Allahabad (West)? My constituency is deeply divided along the caste and communal lines. This seat has been a battleground of mafia don-turned-politician Atiq Ahmad and BSP candidate Pooja Pal (widow of slain BSP leader Raju Pal) for quite some time. Both candidates have been winning this seat turn by turn. More or less, it has been a Muslim versus Hindu issue here with a high-level criminalisation of politics. What is the development scenario? There has been absolutely no development in this place which has seen a lot of communal politics. People are suffering from water scarcity. There are no roads to connect the villages with the city. People are craving even for the basic amenities. This seat was represented by my uncle Chaudhary Naunihal Singhji, who remained the state’s home minister thrice. People remember the developments during his stint, that was some 25 years ago. After that, there has been dismal development in this constituency. Why did Modiji select you for this seat? I call myself an ‘Experiment Boy’ of Modiji. This is a seat where criminals have ruled the roost. Modiji asked me to contest here and give this constituency a new tag of honesty. Being the grandson of late PM Lal Bahadur Shastri, my lineage speaks for myself, my family and its honesty. I am pitted against criminalisation, communalism and non-development. Hence, I call myself the ‘Experiment Boy’ of Modi ji as he has fielded me to take on caste and communal factors. If I win, Modiji will replicate this formula in other seats in 2019. Will you be the party’s CM face post polls? These calls are taken by the party parliamentary board and the legislature party. As of now, I can only say that I am not thinking on those lines (laughs). What if entrusted with this responsibility? I had never thought that I will be pushed to state politics. But when the party asked me, I accepted it and came here. I am a disciplined soldier of the party. Whatever will be the party directive, I will follow it. Your take on BJP going without a CM face? Among CM faces here, Akhilesh Yadav is facing anti-incumbency. The other is Mayawati whose record of development is known to all. People will see those two faces. BJP, as a party, has one face and that is of development and good governance. So, I think the public has already taken the call. What difference will the SP-Congress alliance make? It (the alliance) shows how the Samajwadi Party has lost the plot in the ensuing elections. If you have development as you claim, you don’t hand over 105 seats to a party which is non-existent. Actually, you have done nothing. As a result, you had had to spare these many seats under compulsion. How is BJP positioned vis-a-vis SP-Congress tie-up? The BJP had a slogan—“Congress-Mukt Bharat.” In the context of UP, it could be “Congress Mukt Uttar Pradesh.” The Congress is fighting from only 105 seats meaning they are contesting 25 per cent of the seats. So the state is already free from the party on the remaining 75 per cent seats.